Apple has officially seeded the newest iOS 9.3.2 Beta Update (Build: 13F68) for iPhone, iPad and iPod Touch, as well as Apple Configurator 2.2.1 Beta (Build: 3C68), tvOS 9.2.1 Beta (Build: 13Y772) for Apple TV and watchOS 2.2.1 Beta (Build: 13V420) for Apple Watch devices. The latest firmware and software updates are available for all iOS developers and non-developers (general public) users for upgradation and manual installation. The official Direct Download Links of iOS 9.3.2 Beta IPSW Files for iPad Pro, iPad Mini 4, iPad Mini 3, iPad Mini 2, iPad Mini, iPad Air 4, iPad Air 3, iPad Air 2, iPad Air, iPad 2, iPhone SE, iPhone 6S Plus, iPhone 6S, iPhone 6 Plus, iPhone 6, iPhone 5S, iPhone 5C, iPhone 5, iPhone 4S, iPod Touch 6, iPod Touch 5, Apple TV 4 and Apple Watch are also added at the end of this post. What’s New in iOS 9.3.2 Features? The changelog of latest iOS 9.3.2 Update includes; bug fixes, performance enhancements, stability and security improvements. As we all know, Apple has already patched several exploits and codes require for iOS Jailbreak, so currently iOS 9.3.2 Jailbreaking is not possible through PanGu, TaiG and PP Jailbreak Tools. 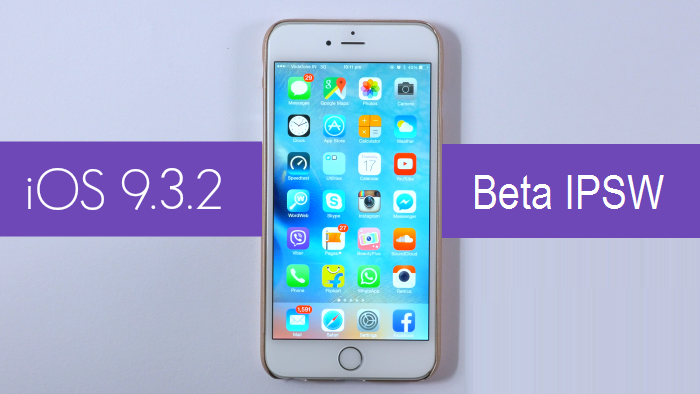 How to Manually Install iOS 9.3.2 Beta Update? For official iOS 9.3.2 Beta OTA Updates, Apple iPhone, iPad and iPod Touch users can navigate to Settings > General > Software Update option on their respective smartphone and tablet models. If you're iOS developer, then simply head-over to iOS developer portal account for instant iOS 9.3.2 Beta Downloads. If you're iOS non-developer, then you can free download, install and activate iOS 9.3.2 Beta without developer account UDID with iTunes for Free. NOTE: The full and final iOS 9.3.2 (13F69), tvOS 9.2.1 (13Y772), and watchOS 2.2.1 (13V420) updates for iPhone, iPad, iPod Touch, Apple TV 4, and Apple Watch are available. Download Now!